This Light Vanilla Sponge Cake is one of my favorites. I bake this one very often as my family loves it too. We have it sliced at tea or whenever we feel like having a piece of cake. 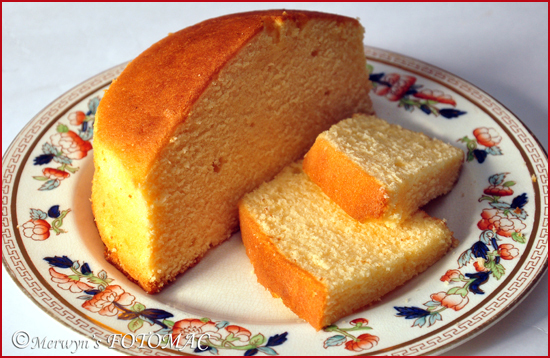 This homemade sponge is so fresh & delicious.. I usually make this light sponge with cream. We buy Chitale Milk which is very good creamy milk from Pune. I skim out the cream after boiling & cooling the milk in the fridge. I store the cream everyday in the freezer & then use it to bake this wonderful vanilla sponge cake. This cake is perfect for me! I sandwich the cakes with jam, butter cream icing etc. This cake is ideal for trifles & tastes lovely with ice cream too! This cake is especially for my friend Sujata Chandekar, who requested for this recipe. Dear Suju, I hope you & your family will relish this cake the way we do..
Sift flour alongwith the baking powder with a sieve about 2 to 3 times. Keep aside for later use. In a sufficiently large bowl, cream butter/cream & sugar till light & fluffy. Add one egg at a time & beat well till all the eggs are incorporated. Add vanilla essence, juice of lime, milk & mix well using a wooden spatula or spoon. Add few tablespoons of flour at a time & mix after each addition using light feathery movements of your hand till all the flour is used. Pour the batter in a greased & lined baking tin. If using two tins divide it equally in the tins. Level with the back of the spoon & bake for about 20-25 mins. in a pre-heated oven at 160C. Let the cake stand in the pans for about 10 mins. before turning it on the cooling rack. Cool the cake completely on a wire rack. Slice the cake as desired & serve with a cup of your favorite chai or coffee. Size of Baking Pans: It is important to use the correct size of pan for baking according to the amount of the cake batter. For the above mentioned cake, you may use two 6 inch diameter round baking tins or one 9 inch diameter baking tin. (I used my two pressure cooker aluminium tins). I generally use two tins so I can sandwich them with jam or butter icing or I can use one cake at a time. Greasing & Lining of Baking Pans : Always grease & line your baking tins/trays. In case you do not have non-stick baking parchment or butter paper, do not worry just grease your baking tin with butter & lightly dust with some maida. Your baking pans are ready for baking. To dust pans with flour : Put some flour in the greased pan/tin/tray. Gently roll the pan from side to side so that the flour gets evenly distributed to the greased pan & clings to it. Lightly tap the tin from the outside & remove excess flour by over turning the tin. Oven Temperature : Baking temperatures vary for different ovens. Use the temperature which is meant for your oven. If your cake is peaking or browning quickly on the top then it may be raw inside.. control by reducing the temperature a little. Quality of ingredients also play an important role in the final outcome of the cake. Sifting of flour, creaming of butter/cream, size of the eggs, correct amount of baking powder, will determine the texture, lightness & perfection of the finished cake. The batter should be of dropping consistency. The batter should not be too thick or runny. If it is too thick add a few teaspoons of milk & if it is runny then add a little flour. Control the use of milk & flour by adding a spoonful at a time & mixing it. Do not over mix the batter. The Cake Test : Do not open the oven in between.. you may open for testing after about 20 mins. The sponge cake is almost done when you get a good aroma. Test by inserting a wooden skewer in the center of the cake. The skewer should come out clean. The sponge cake should be springy to the touch or when a skewer inserted in the cake comes out clean. The spnge cake looks so light! am never able to get that sponginess. My cakes are always a bit heavy and the crust is hard. Lovely cake.If i need to add mava in your vanilla sponge cake.How much can i add to make a mava cake.Thanks,Love ya.God bless!! I tried out your recipe yesterday. I donot know where i went wrong but my cake turned out hard n dry. Even the barter had become really dry. Can you please guide me as to what needs to be done. The cake looks yummy! Can you please give me the measurements of this vanilla sponge cake in cups.